My new front door was installed yesterday! Let’s just say I’m so glad I didn’t try to DIY this project. They got here yesterday about 4:00, and I think it took them until 6:30 to get it installed and everything working right. First, there was an issue with the threshold, then there was an issue with the deadbolt not wanting to lock all the way. But they finally got all the issues worked out, and my entryway now has some natural light in it! And yes, that’s my truck still (or rather, again) sitting in my front yard. 😀 Now before you judge me too harshly, let me explain that it’s there quite by design. My new 9-light half glass door for the breakfast room is in the back of that truck since I forgot to ask the guys to move it before they left, and it’s WAY too heavy for me to move on my own. So I wanted it placed strategically in front of my Ring camera doorbell so that it would catch any movement during the night and notify my phone if someone tried to steal it. I promise that parking in my front yard really isn’t a habit of mine. 😀 And they’ll be back today to install that door in the breakfast room, so I can return my truck to its normal parking space in the driveway. Anyway, I love this door. I’m going to love the amount of light it lets in to that previously dark corner of the room. I was surprised at how many of you said that a full lite door looks too modern or industrial. I just don’t see that. I think it goes great with a traditional style home. Anyway, I wanted this door for the natural light without the busyness of lots of added rectangles that a 9-lite or 15-lite door would add. But I’ve now lived with it for one night, and I do want to come up with a solution to add some privacy. I’m tossing around three different ideas in my mind. Two would add privacy just at night, while the third would add privacy all the time. Quite honestly, I’m not sure which one I want just yet, because I really do enjoy the view out the door. Of course, I’ve had it less than 24 hours, so I want to live with it for a few more days before decicing. The first option is to add a curtain, which would add privacy just at night, while keeping the view through the door clear during the day. I found this one example with the door and window arranged very similar mine, and with two curtain panels on the window like I will have, but just one on the door. While it looks like this curtain panel isn’t actually used (I can’t imagine pulling it back with a tassel tie back every day), I really do like the look. I don’t really think a double-width curtain panel is needed for the door, though. If I go with this option, I’ll just stick with a single-width curtain panel. I tried to do a little mock up of what mine might look like. I did a pretty rough editing job here, but I think we can get an idea. I wasn’t sure I would like that option, but I think it might be my favorite. 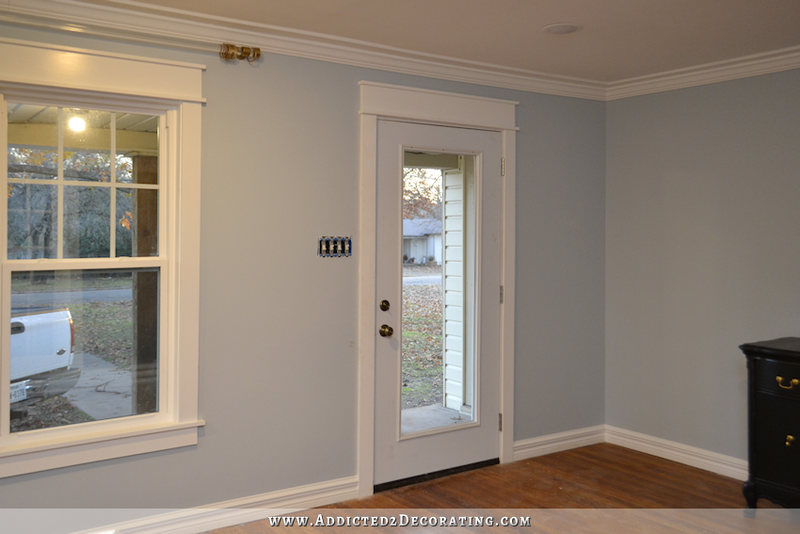 And if I go this route, I’d probably paint the front door the same color as the trim so that the look of the curtained door coordinates with the look of the curtained windows. 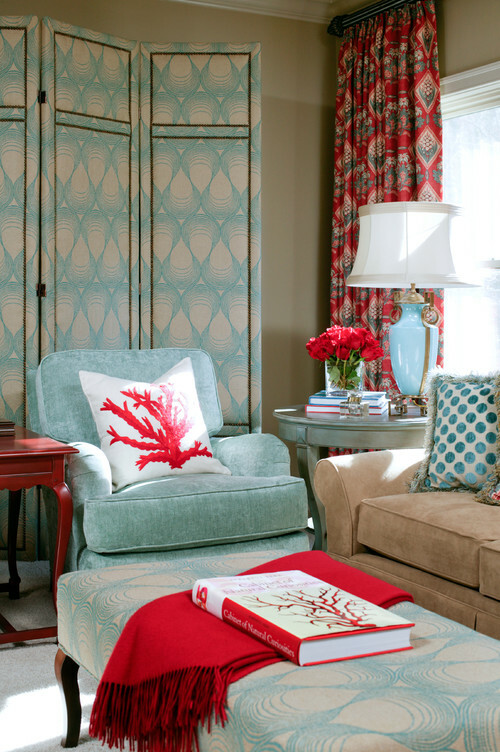 Although that one is way too big for my smaller room, and I actually prefer upholstered folding screens. They’re a great way to add pattern and texture to a room. But again, I’d need one much smaller, and I might only need two panels rather than three or more. 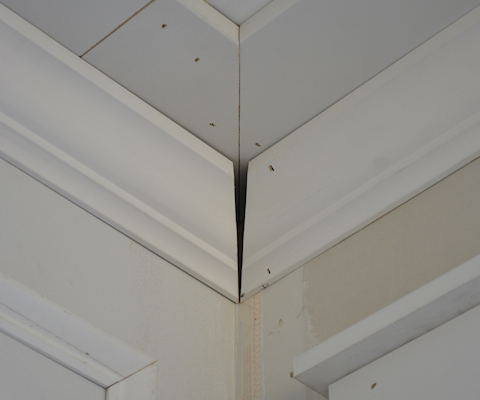 And rather than the panels being on hinges, I could attach them in a fixed angle. Two much smaller panels with casters attached with hardware on a fixed angle would be quite easy to move each night, I believe. Especially if they’re made of something lightweight, like narrow hollow core closet doors. And the third option that I’ve come across that I really like would give privacy both during the day and at night. While I love this idea, I’m still not sure that I want to obscure the view through the door during the day. I need to live with it for a bit longer before I decide. But if I decide that I’m okay with an obscured view, I love this idea of frosting most of the glass, but leaving just a bit of the glass clear with a design like house numbers. Someone standing just outside the door would still be able to see in, but there wouldn’t be a clear view into my house from the street. That would not be a DIY project. Something like house numbers would require precision work, so I’d have a local sign shop do that for me. So those are the three options I’m considering right now. Each of them has pros and cons, so I just need to live with my new door a couple more days before deciding which option will work best for me. EDIT: Well, I’ve lived with my new door for about 17 hours now, and only a few of those have been daylight hours. After that short amount of time, I can already tell you that frosted glass is not an option. I ABSOLUTELY LOVE being able to see out of my front door with no obstructed view. So while I really love the look, I’m ruling out Option #3. They sell frosted film you can apply to the window so you don’t need to make it permanent. If I go with the frosted glass option, I don’t want the whole thing frosted. I’ve used that film several times, and it’s great stuff, but I don’t want to DIY frost the front door with a design in it. It’s spray paint window frosting. It looks, and feels, like the real thing. And not all plastic like the films do. Because it’s paint, you can tape off any design you want in it, with sharp clean edges, just like with real frosting. And it scrapes off the glass with a razor blade, just like if you get regular paint on glass, so if you get sick of the design (or off having it frosted and you want curtains instead) you can change it. I’ve got the same door you’ve got, frosted, with the house number in it, and over the years I’ve done several different takes on how exactly I’ve got the house number looking (both because I wanted something new, and because, it comes off when you tape it to paint the front door, and I like doing my front door in different paints every few years). This stuff looks really awesome! It looks like it has to be plugged in tho’ – I don’t know how well that would work on a door… and I sure wouldn’t want to know how expensive it is lol! I vote for the frosted option. Such a lovely door! Good for you! What about a hinged swing arm curtain rod? I was going to suggest the very same thing. I have gone all the aforementioned routes. But I am most pleased with my swing arm rod on my front door. It looks great, has both full light and night time privacy options. I bought mine at wayfair and was pleasantly surprised at how much more affordable this option was. Another option would be to do a split one. Upper and lower rods. That door is incredible. I love it. I don’t know if you can find them anywhere, but in RV’s, they use these cellular blinds that are on tracks instead of cords. The advantage to them is that they don’t bang when you swing the door open and shut. I wonder if there are any window treatments like that out there, aside from a double rod curtain like they used to use on doors years ago. Home Depot sells a custom blind that can be attached to an existing door and is encased with the blind and mechanism inside. I like the curtain option the most. I think you have a nice view out the door, so you might as well be able to enjoy it when you want, so the frosted option would limit you. I have the same type of door on my master balcony, and I have a shade installed. I’m not all that stylish, so I can’t really say if that would appeal to you, but I do like the functionality of it. I’ve never noticed a curtain on a door like that, but I like the idea and am already thinking of how I can incorporate it in my house. I also like that it adds an insulating factor against drafts, which is something to think about for my climate. I loooove the frosted and now I’m thinking about it for my door The problem would be I have a double door and a street number wouldn’t work so I would love any ideas I have blinds right now I hate them! I would have to have privacy! 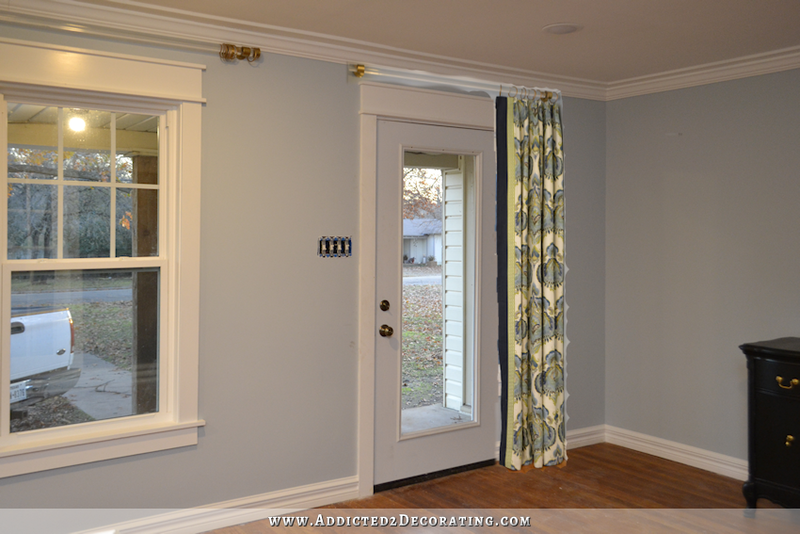 Would you make the drapery rods where you have some space between the curtain and the door facing? I would have to see the balance of the whole wall in relation to the spacing, etc. Could you put the upholstered panels on hinges so that they would easily swing to obstruct the view from the street then swing back towards the corner out of the way? So, just my opinion, but I think you should go for one of the options other than more of your drapery fabric. I think you’re going to have a lot of it in the room once all of your drapes are up and that a different texture would be nice. I like the frosted glass, but once you have your new front porch and landscaped yard, you’ll want to be able to see out! My preference would be the decorative screen option. I think it would be a great way to add an additional design element to your room. My husband and I installed a full lite door at our last house. I DIY’d the frosted film a couple of different times to go with a couple of decor design changes (rectangle outline, herons (we lived in Fl), geometric). A ruler, French curves, painter’s tape, stencil and a very sharp Xacto knife make it pretty simple. I also frosted my sister’s half lite door with a spray that looks pretty convincing. We used spray adhesive to adhere a “stencil” of a chicken and a “fresh eggs” design first before spraying the glass with the frosted effect. Came out really great and was pretty straightforward. Just a couple of ideas. Looking forward to seeing what you decide to do. That last pic is gorgeous! The screen idea seems fussy, but could have hooks on the back for guest coats. The curtain thing is common in Europe, to block drafts through those old doors. The one shown is probably the real deal, tie-back and all. This is so cool. I am installing a single light door and am going to look into this. They have that glass as the bathroom walls in the st. Regis in Kauai! I loved flipped the switch and seeing it fog! You have so much room to the right of your door- what about a hinged or sliding shutter/barn door for privacy at night? It would look beautiful! I did this for my front door, but I used fabric. I sewed a simple rectangle of fabric that covered the window in my door and used clip magnets to hold it in place. To me the use of frosted glass defeats the purpose of having the full window. Sure some light comes in, but not the same as unfrosted. I suggest a pretty roman shade. I think the screen is fussy, as someone else suggested, and the drapery option seems more suitable in an old house (I have one for drafts in 180 year-old house on original old beautiful door). Love the door and now I am positive that is what I want for my front door. I am also adding full lite French doors off the back deck and another off my master bedroom that faces the back deck. I am going to look into the smart glass idea. Like someone else said, if you had wanted the frosted you would have ordered it that way. Moving a screen around just seems like a pain and since you are going for a clean simple look that wouldn’t work. As far as curtains, to me you will have plenty of draperies and the whole idea of having a door like that is the simplicity of it. I vote for smart glass if it’s not too cost prohibitive. I want to know when you ever SIT and look out the door? You are always busy on projects! Maybe you are thinking when you walk through the room and glance out the door. Just teasing. You are such a busy lady that I have a hard time picturing you actually being still! it’s a beautiful door, which I’ve had before, but on the back. Have a full glass one now as a second door on the front, but it faces my carport. Privacy from the street is very important – more for ne’er-do-wells than dwellers I think. Curtains (#1) would be easiest but I’m not personally fond of that. I do like the screen idea and have used that when I lived in an apt. I have an open-work screen and lined it with a gauzy material, very gathered. At night you could only see maybe a dark shape if someone was right in front of the door. So count me in for the screen idea. Mine had 3 panels and was very light wood. I actually kept it in front of window all the time as light came through and I could make out what was going on outside but no one could actually see my body. Do what you like, as you usually do. Try not to make a solution permanent until you can test it out as you know how you change your mind (like me!). If you wanted frosted glass, I think you would have gotten that to begin with. Can’t wait to see your decision as you are usually out-of-the-box and always inspire me! Why don’t you do a trial run of all 3 and see which you like best? I would use the stick on film to see if you like the frosted look. If you do, then you can have it professionally done. Similarly, put up a curtain rod, hang the one panel you have already finished, and test out the curtain option. Personally, having to move the privacy screen every morning and night, and keep it somewhere in the room would drive me crazy. But it is easy enough to test out and isn’t permanent. Enjoy the new door and the extra light! I think the curtains will be a bit fussy and heavy for this light and airy door. Have you considered sheers? They are traditional while still being translucent. We have curtains at the front door and plantation shutters on a side door and they both work very well. We have glass side panels either side of the front door so have a fixed rod above the door. The curtains pull to the side so offer plenty of light during the day. You need something like curtains as otherwise you lose a lot of heat in winter. I honestly never understand what the big privacy issue is. I figure as long as I’m not walking around naked, why do I care if someone can see me? I don’t have any coverings on any windows or doors except my bedroom & bath. I hate feeling exposed at night! I think I would go this route – if I was choosing curtains. It would repeat your other draperies without being too much of the same. That said, I lean towards the frosted glass. I love the last example with the house number. You could also choose a different motif – or just an open circle. I think the screen idea is just too fussy. For the house number you could have it cut from vinyl from an Etsy seller and install it yourself. As far as privacy, I would prefer privacy during the day when a solicitor shows up and I don’t want them to see that I’m home. So I would pick some sort of privacy film so that the light would still shine through. I don’t think I’d be afraid of solicitors either. She has the Ring doorbell with intercom and she can ask what they want away from the door, and if she doesn’t want it just say no thank you and you’re done. I think having that doorbell is going to be a great thing. In my last house I purchased blinds to fit over the glass in my doors. They were were in a frame work that just fit perfectly over the single pain of glass like your new door. After it is installed it is a blind incased in glass I know I didn’t explain it well. I got them at Home Depot for about $100. It was money well spent and are still holding up well after about 15 years. Just a though while deciding. They make magnetic curtain rods for steel doors. No drilling. Make a flat panel to cover window. You can take it down when you wish. Easier than moving a panel or large curtain out of the way. Drapery fabric for inside & solid for street side. You can use this while you make your decision . I honestly think ANY of the above options defeat the purpose of a full glass door. Another panel of heavy drapery fabric hanging there is going to take away from the light open feel that the glass door provides and a free standing screen just looks cluttered. If you just have to have something, the frosted film is the least intrusive option, but truthfully, I think you should embrace the glass door for what it is. Live with it the way it is, since you seemed to love the look of it so much. After a while, you’ll get over feeling so exposed. It’s just really different from what you’ve been used to. If you want to try a frost but are not yet committed to having the glass etched permanently, check out Wallpaper for Windows. I got a tropical pattern (I’m in Florida) for a window up high in our shower for a little privacy and to filter the morning sun. It works perfectly. I love the look of the curtain too but agree that it would be a little too much of that fabric. I really prefer the frosted glass. Etched with house numbers it really looks beautiful. Not much a fan of the curtains. They give a really heavy look to the entry especially when the front room window is curtained too. Love love love the new paint color. Why choose a full glass door if your going to cover it up? Not a fan of the curtain idea…but you already know what your going to do. I really gave to stop reacting to the comments bait. No, I really didn’t know what I was going to do when I wrote this post this morning, and I really resent the insulation that I’m some kind of deceitful person. I was considering all three options, and hadn’t decided which one I wanted to use. Comments bait? Are you freaking kidding me? WHO’S MAKING YOU COMMENT? You realize commenting isn’t mandatory, right? You can still read my blog (or any other blog) if you don’t comment. Wasn’t trying to insult you…my comment is my opinion. Sorry that you are having a “bad day” Grace. The Holidays can make some of us tense and cranky. I hope your mood passes quickly. (A short walk outside always helps me.) Merry Christmas. My post was simply my opinion not meant to be an insult. The assumption that I’m having a bad day is clear since you are probably not of the same opinion. No worries though…I never said it was anyone else’s point of view, just my own. I like the frosted glass with a design in it, or a panel curtain inset into the glass. The drape along side the door is too much to me. You could get a panel curtain in pretty color that coordinates with your other stuff. Love the frosted glass with the house number!! We hung a retractable shade at the top of the French doors in my husbands office. It is white and blends in with the white door. When he needs privacy, he just lowers it. Otherwise, it’s out of sight – out of mind. It was an easy and inexpensive solution. Boy oh boy, am I glad I’m not you! I LOvE all 3 ideas and just couldn’t choose. I think the screen idea is brilliant and I wouldn’t have thought of it in a jilipn years. Love your door, and I vote for the curtain. Can’t go wrong, if you want privacy during the day or night a simple pull would be the answer, plus more texture and color is never a bad thing. I do suggest black out lining for extra light control and privacy. I guess we’re rednecks because if everyone is home there’s always a truck somewhere in the yard. I won’t judge!! But out here in the country is different than a subdivision!!! What about blinds or a roman shade? You could pull it up during the day to have the view and then let it down in the evenings for privacy. I would love to have this option but in Nebraska it gets too cold. Two of my SILs live in Waco on two busy streets and have the full glass option and love it…Personally, I’d leave it as is. I mentioned that we have several full view doors in our home. We wanted the view most of the time, so we chose this simple fabric curtain that attaches to the door using Velcro and the curtain is rolled up and two straps hold it in place with Velcro under the valance. Two coordinating fabrics are used for a nice look. With your talent, you will be able to make it look gorgeous! Have you thought about a roman shade? We have two sets of french doors with glass like your front door. We put a narrow roman shade on each door in a coordinating solid color and attached them to the door with velcro. I found them on Amazon. You could try out the frosted effect with the peel and stick film. The mostly frosted with the house number is a neat idea and allows a peep hole-like area. A cut/etched glass decorative window instead of the plain one. A sheet of the beaded or other specialty glass for the light, but distortion. Depending on your neighborhood, distortion might be better for stalkers, etc. And some of the solicitors are obnoxious. Mock up all your options and try each one out. Consider the privacy, light and temperature/fading along with convenience for you and Matt. It’s winter now, but think about spring and summer too. I would prefer the frosted glass option. I hate to sound like a “Debbie Downer” but I feel that the drapes could present a safety hazard if you had to evacuate (heaven forbid of course! ), your home in the event of a fire or other emergency situation. To everyone who has suggested the “smart glass” option. Glass of this type came out 30+ years ago and was $$$$ at that time. The big issue with it is it’s opaque in the non-electrified state. So, if you want it transparent it is using electricity. I doubt it uses much juice but, just FYI. Another thought is a simple, very lightweight, interior door (no jamb) that you close over the full glass one. BTW – LOVE that door! Love the frosted option for sure. The others seem too bulky for an entry area. Question: What does one do with those holes in the trim around the glass? I have those in a door and don’t know how to fill them. Mine came with a little package of plastic hole fillers. I’m just too short to read the top three, and then got sidetracked and forgot to put those in. My back doors look exactly like yours and for privacy we have just a sheer curtain hanging on each. They make magnetic curtain rods just for doors like these. Hang your sheer and you are all done. You can have either one rod at the top or add another under the window to prevent movement. Gives privacy from the outside, but lets all the light through. Don’t they make that door with a mini-blind in between the 2 panes of glass, that you can slide up and down? I think that’s what I would choose! Yes, and Home Depot carries a door like that in stock, but I opted for the one without because I don’t like blinds to begin with, and white mini blinds are my absolute least favorite. 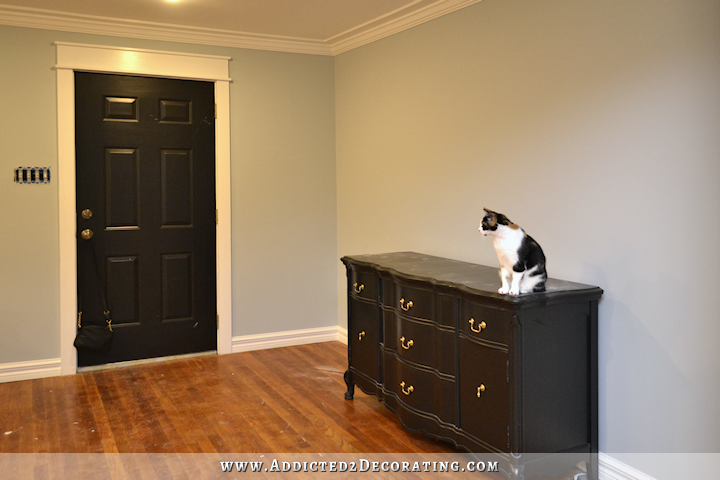 HI – Your new door is so beautiful – love it! Until reading the comments, I would have never thought of the “safety issue” but I suppose it’s a good idea to keep that in mind. My “vote” would be for the frosted, but I think you’re moving away from that option. One other thought – I like the idea of the curtain, but, to me, one panel looks a little off. Would you ever treat the door like a window, and frame it with panels – I see the light switch, but I don’t think that’s a big deal. Unlike some of the other commenters, I don’t think a curtain panel (or two!) of your fabric would be too much. This way you can put it up when you want or not have anything at all. Oh, now that’s brilliant!! I was just looking up “magnetic curtain rods,” and while I found many, my main concern was that if I was going to completely remove the curtain every day (I don’t want to look at a curtain rod or fabric hanging on my door at all during the day), then I run the risk of scratching the painted door with the magnets. But this design takes care of that problem since the magnets are encased in fabric! I think this is exactly what I’m looking for. As I’m closing up each night, going around and check the doors to be sure they’re locked, closing windows, and closing the window shades, it would take about 30 extra seconds to just pop this onto the door. And in the mornings, as I’m opening up the window shades, it would take about 30 seconds (if that) to pull this down, fold it, and stick it in a drawer for the day. I LOVE this idea!!! This is such a great idea. While I love the natural light of your new door, sometimes I want just a tab bit of privacy. Your new video doorbell is a great compliment to closing up the window later in the evening. You have the greatest group of readers, some of the suggestions sometimes don’t work for you, but they may for your readers. Thanks Kristi and Bri!! Lovely door. My problem with large expanses of naked glass is not the privacy issue. The glass usually looks great in the daytime when light is coming in. But at night it turns into a black sheet of reflective glass that dominates the room. And unless black is a part of one’s decorating scheme it doesn’t add anything to the look of the room. I had a sun room with large windows that I left undressed. It was wonderful by day but at night I didn’t want to go into it because it was cold- and unfriendly-feeling. I finally put up blinds and now love the room day and night. I like the idea of the paneled screen. 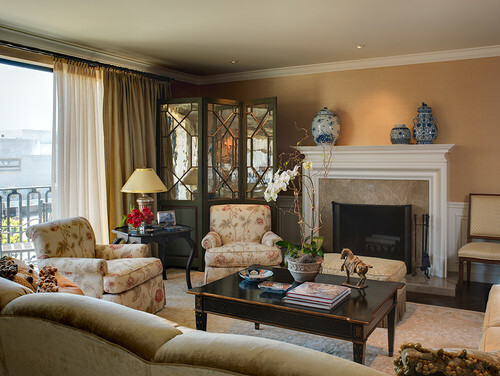 It wouldn’t be much more work to move it than to operate curtains, and it could be a great design element in the room. 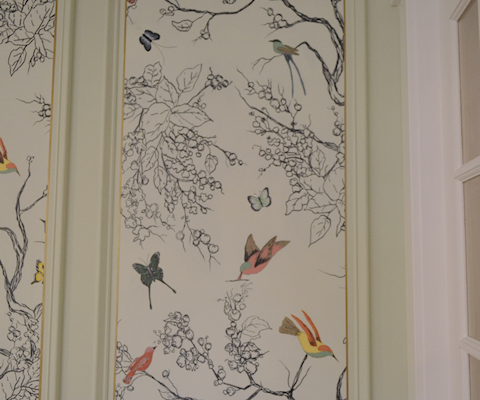 Maybe paint it with your bird and butterfly ‘wallpaper’? The frosted glass seems to negate the whole point of the full-view glass. And more drapery seems redundant. It’ll be interesting to see what you decide! I would hesitate on having a screen in front of my door at night. I’ve had two house fires and one was at 11:30 at night and as we exited our bedroom the smoke was so thick we could not see two feet in front of us. Having to move a screen out of the way to get out would have been a nightmare. I like the curtain idea and you would be able to have room for it not to interfere with using the door. In an emergency, it would easy to move and not fall or be in the way. I love beautiful rooms but safety is always my first priority. I’m sure you’ll come up with just the right answer. Looking forward to seeing what you choose. I am going to comment on a totally different thing. Washing all those windows. I have been using these amazing cloths from streakfree.com for a few years now and highly recommend them. You wet them, wring them out really well and then wipe down your windows. No drying, just walk away onto the next window. They will dry streak free. No cleaner, just plain water. Follow the instructions on the bag and that’s it. They can be washed, bleached and re-used. I just this morning did my windows and was done in no time. With all the windows in your house, I think you will appreciate these gems.They are reasonably priced and worth every penny. Everyone I gave one to has used them and raved about them. They are great on stainless steel and other appliances.But, the windows are where they are the best. Can you tell that I swear by this product? You’ve already ruled out the frosted glass, but if you consider something like it someplace else, remember your Silhouette! I bought mine because you wrote about it a couple of years back and I have the feeling that you haven’t tried it much? I’m still taking baby steps with it and am convinced that there is still loads to learn and do, but I do like a lot of crafting techniques so it’s only one of my tools here. But for cutting a design to frost a window it would be perfect! The door looks great, but I still can’t figure out why you didn’t go with the full lite door with interior shade. It can be raised completely during the day, so it’s not even visible, and lowered at night, and also turned to open while in the down position for filtered light. 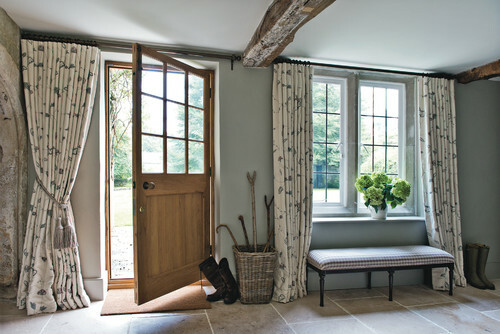 We love ours in our French doors, it a very clean look, with the fuss of a curtain. I agree about the view – I love an unobstructed view, but hate the curtain look and the screen in front of a door is definitely a hazard – blocking egress in event of emergency. Plus I can’t imagine moving it around every day – actually putting a tie back around a curtain would be a lot easier. I didnt’ take the time to read all the other comments but…………..if no one has suggested it and you decide to build something like Option 2, why not build it to match somehow to your doors you built going into the music room? I think that design would be gorgeous in front of the door. Wow – that door makes such a huge difference in your space. It’s perfect! That said, I think it would be such a shame to cover it up with anything. I think if privacy is an issue, you should have picked a different door (and I’m being very sincere and respectful with my comment – I am a huge fan of your work and completely relate to all of your methods of madness!). It seems to me like the privacy solutions with just come across as solutions to a problem rather than delightful design decisions, which I would personally be frustrated with after putting in the time and expense of choosing and installing such a “statement piece” as a front door. I know you will figure it out and make it work though – you always come around to just the right thing in the end. How interesting that I’ve just been considering a full lite front door. But I’m almost positive I and double pane, with a blind to raise or lower between the two panes. That’s my thought at the moment. And I think I want a pretty screen door, and just hope it squeaks and slams. My 100 year old house has a two thirds beveled glass (original to the house) and is not modern at all. The curtain idea is great. It will also keep your house warm. My entry way is freezing and if I can figure out how to make it work, I will use it. My door is wood and currently still has the mini blinds (hung on the door) from a previous owner. They are very practical, but not very pretty. I had a similar delima only with a bathroom door. I had a frosted pattern made that I applied to the door and it is like your third option. The sky is the limit with what you could come up with. Good luck. Can’t wait to see what you decide on! Live with it for awhile longer. What you feel is the right option will come to you. But with a motion light outside and security it’s not bad the way it is. We’re still deciding. Friends bought a house whose sidewalk ran parallel to the very large bathroom window. They went with frosted glass and loved the privacy it gave while still allowing light to flood the room. I have what’s known as rainfall glass in my front door. I get lots of light, can tell if someone’s standing at the door (I also have a peep hole set for a 5’1″ woman) and heat or air conditioning loss isn’t a problem. I must say that I love the curtain and crystal rod by the door. Very English country house! I can see you doing this in addition to the frosting. 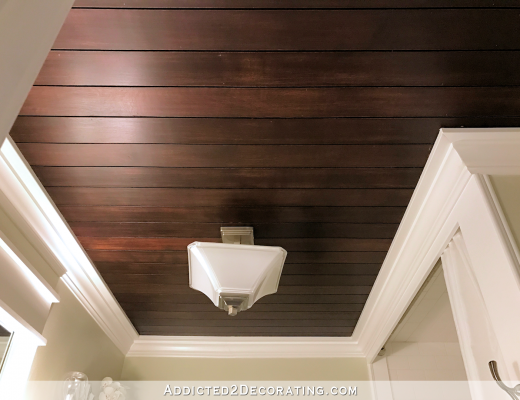 Even if you never close it, it really ties the entry and living room together. I can’t wait to see what your version looks like. What about a Roman shade? Or a film or treatment that lets you see out, but that you cannot see in? Hi kristi. I thought you’d like to know my parents house was built in the 1920’s so your front door definitely fits for the age and style of your house. I think they had sheers with the rod at the top and bottom of the window.I have a 1925 house and I have a door like that only it has the blinds built between the glass. I love your fireplace and agree the walls look more casual without the trim, and I have a feeling that’s why you changed the cabinets in your kitchen. I loved your green, but all the trim made it too formal. I like your living room curtains too because the stripes were too casual for a living room, but great for a dining room!! LOL So many choices!! Don’t worry most of us change things in our homes all the time. I really admire the work you do and look forward to reading your posts. Yikes, all this for a door! I think the idea of a swing rod, top and bottom would be good. You could have a semi sheer that matches the backround of your print, and pop it open during the day, and close it at night. The other options for me are, the curtain panel to the side. Once you close it, you can’t see anything. What if someone comes knocking after dark? The screen would be too much for your space. Your room is not that big and to use up real estate for something to cover the windows seems a bit of a waste. 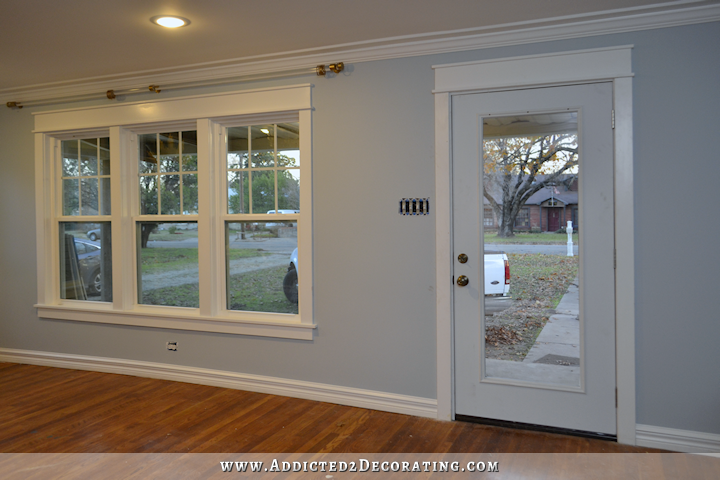 I agree with the person who said the frosted glass looked to modern for your craftsman house, and those magnatic things, no offense to the owner, are hideous. It looks like you are being drawn back to “crazy clorors.” Hope you have a great 2017 and that house gets close to being done!